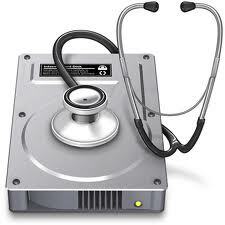 It’s a good idea to check the hard drive health of a Mac as part of a periodic maintenance routine. 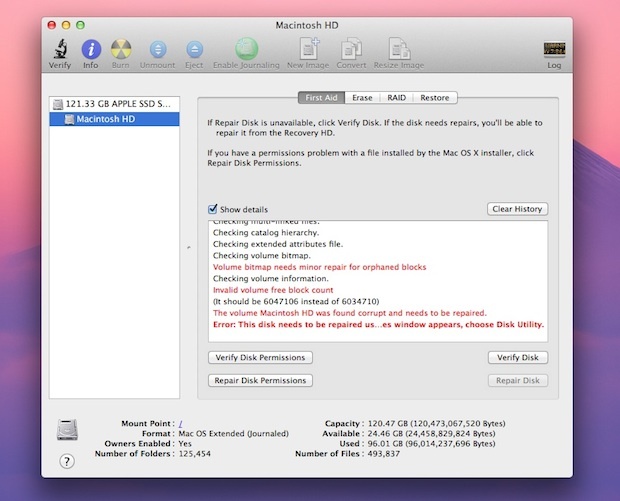 Doing this is extremely easy with Disk Utility, and we’ll cover exactly how to verify hard disks, how to repair them, and what to do if you encounter any issues or errors in the process. This works for all hard drives, whether it’s an internal drive, an external drive, or a boot disk, though the process is slightly different for boot drives. Let’s begin. If you do see a red message saying something along the lines of “Error: This disk needs to be repaired” you can just choose to click the “Repair Disk” button to start that repair process, that will work for any internal or external drive – unless the drive in question is your boot disk, then you will find the “Repair Disk” button is inaccessible. That doesn’t mean you can’t repair the boot drive though, it just requires an additional step which we’ll cover next. In this case all you need to do is reboot into the Recovery HD partition and run Repair Disk from there, here’s how to do that in OS X Lion, Mountain Lion, and OS X Mavericks. Before proceeding it’s a good idea to backup your drive quickly with Time Machine. After Repair Disk has ran successfully, you are free to boot OS X as normal and the drives issues should be resolved. A few final notes: relying on a hard drive being healthy is not an alternative to having backups, you need to backup your Mac with regularity using Time Machine or some other method if you choose. Hard drives fail, it’s a fact of computing life. It’s also important to note Disk Utility isn’t a 100% conclusive test suite to determine drive health, and if you hear weird sounds coming out of the hard drive it’s probably a good time to head down to Apple and prepare for a drive swap because that drive is likely going to croak soon. Finally, if you need to perform further maintenance on the disk, then you may need to use fsck to repair the drive, which is a bit more complex and requires the usage of the command line. As Friv said below, at one point in your life you didn’t know about this “common knowledge”. You weren’t born with this knowledge and likely learned it from a person, a book, or even a website like this one…the same goes for changing a tire or checking the oil. Why don’t you show some maturity and instead of shaming those who lack this knowledge, like you once did, be a leader and teach and empower others like this author has! @MacTech Didn’t find your comment offensive or “shaming.” Not sure why people are so sensitive. And yes, I have personally experienced the sting (and mayhem) of data loss. Recovery HD: For me to Reboot the iMac, need to hold down the Option key. this is not in fact “Hard Drive Health” as the health of the actual drive can not be evaluated. it is actually and more correctly the health of os x’s file system on the primary partition or volume of the hard disk drive (or ssd or flash drive) as opposed to the hdd’s health itself. Yes exactly. Disk Utility is only nearly as useful as CHKDSK in Windows. To check physical hard disk health on a Mac you either have to buy an application, or take the disk out of the mac and test it in a Windows/Linux PC. Command + R didn’t work for me. (2010 iMac 27” running Lion). I used the Option key. Disk repair was successful. Thanks for the tip! I wouldn’t have known to do this otherwise. Can anyone tell me if this is necessary if I have SMARTReporter installed? Someone who can’t change a tire or do an oil change has no business driving a card. Someone who can’t do basic maintenance on a computer has no business using one either. If you are going to spend this much money on a computer, you should take a few hours of research to learn how to maintain it. Someone who can’t spell check a paragraph has no business using a keyboard. The difference is that if your tire blows you may be putting yourself and others in danger. Somehow, in spite of his misspelling, you managed to understand his post and respond. But if you think it is that important, you should start a company to sell insurance for it. One never knows when a spelllling mishap may occur! wtf are you talking about. I think you and Mac Tech are idiots in here. Lot of people (my mom and your fken mom) can’t change tire or even do an oil check but still using car every day. What’s wrong with that? One owns the laptop/pc doesn’t mean he/she need to know these stuff. That’s why we have IT support staff in every company. MacTech, at one point in your life you didn’t know how to verify a disk in osx. The world is always grateful to have been bestowed with a genius like yourself. The procedure is fine for isolating indexing problems. For people that get indices messed up beyond repair, people have yielded high praise for “Disk Warrior.” Disk Utility won’t find bad sectors, especially if they’re on a region of a drive not used. We use a tool called “Scannerz” for that because it can find a lot of other problems to. I must clearly be doing something wrong! I’ve been using OS X since its inception back around 2000 and have never needed anything more than disk utility to correct index problems. It DOES need it once in a while, but Disk Utility has always been able to handle them. It makes me wonder if some apps (that I don’t use) are doing odd things to the drive. Scannerz and Disk Warrior rock. Scannerz finds weak sectors along with bad sectors and can be used to troubleshoot cable and system problems. It’s pure testing but it’s the best. Disk Warrior also rocks because it can reconstruct drive index files on a problematic drive. A few other tools (that I’m not going to name) say they can do the same thing, but I haven’t been impressed with them – kind of like comparing a Yugo to a Ferrari, if you get my drift. One tool not mentioned is smartmontools – not for the faint of heart and it’s SMART testing, but it’s free and excellent. smartmontools has smartctl which displays the current SMART status of a drive in considerable detail, and smartd which is a daemon process to periodically monitor the SMART status of a drive. It’s an old style app from the Unix/Linux world, ported to OS X that uses a command line interface. There are some graphical user interfaces for it but they may require X-Windows. If you want real SMART monitoring, this is the way to go. Difficult for many, yes, but details beyond anything else. Hi, will this erase automatically all my data from my hard drive? As I have understood, it doesn’t. Am I right? This doesn’t help me. I’m getting an error that Live File System Error Repair is not supported. I got further than this on my own, but I haven’t got my computer operating yet. (And I don’t even know how to change a tire.) I’ll keep looking. It does help you, but you must reboot from another boot drive or the Recovery partition to repair the file system of the main drive. Hold down OPTION on reboot, choose “RECOVERY HD” and Repair from there. Disk warrior,Gemini,memory finder,clean my Mac 2 – brought my 2007 iMac 24″ back to life. Runs like its brand new. I record music using Logic Pro and my system was dragging so bad with the dreaded wheel of death I was dead in the water. Was one step out from buying another imac. Back in business !!!! After the disk utility finds everything ok, what to do next? Just restart the mac? « What Happens When Two Mac Fans Get Married?